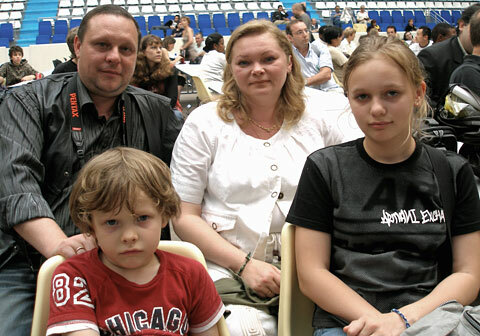 9/2/2009 – This International Open chess tournament is like no other – held not in a small, touristy town but in the heart of the "City of Light" and is billed as the Paris Championship. The venue is the sports gymnasium Coubertin, where this year 643 players, divided in three groups, were able to take part. 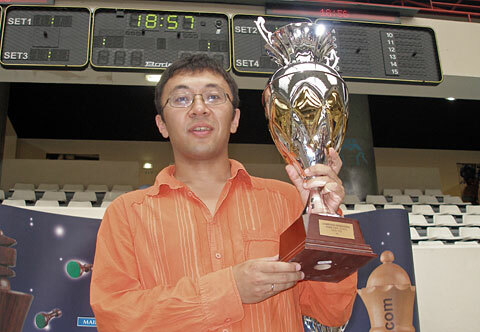 The winner was a Kazakh grandmaster who is in love with the city. Report by Diana Mihajlova. Many open chess tournaments take place in small, touristy sites with a main hotel that hosts, in most cases, the playing hall and the majority of players with the remaining players congregating in various types of accommodation in the vicinity. They also tend to take place out of season, which can help the organisers to negotiate favourable terms with hotels and perhaps afford to offer attractive conditions to titled players. But when a tournament takes place in the ‘City of Lights’, the world capital of tourism and during the peak of the summer season, all these considerations become irrelevant. 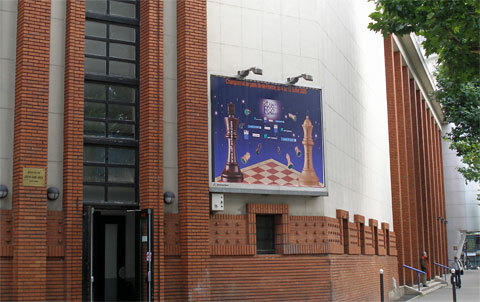 The Paris Chess Federation (League d’Ile de France) manages however to mount the Paris Championship, a very successful yearly open tournament, which is largely supported by the Mayor of the 16th arrondissment (Paris is composed of 20 arrondissments or districts) who makes available the playing venue, the sports gymnasium Coubertin. Le Stade (stadium) Coubertain is situated on the peripheral south east of Paris, perfectly reachable by the fabled Paris metro but, as in my case – and I was based in a relatively central part of the metropolis – only after 25 stops, two or three changes and about one hour journey. Not that bad, considering we are talking about one of the largest capitals in Europe with more than two million inhabitants and 45 million tourists per year. Once arrived, the playing venue was very pleasant and comfortably large to receive the 643 players divided in three groups: A, B, C and a FIDE masters section. 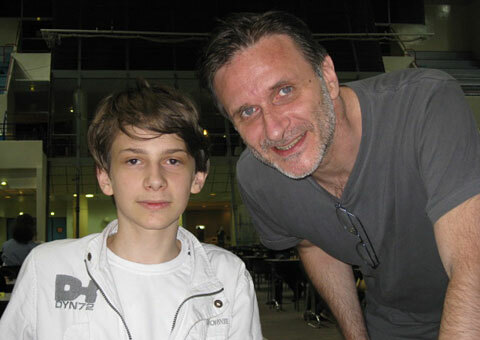 From a conversation with André Rasneur, the Secretary General of the League Île-de-France des Echecs, I understand that the tournament has been running since about 1925 and is among the oldest in Europe. (‘League Île-de-France des Echecs’ stands for Paris Chess Federation. ‘Île- de-France’ literally translates as Isle of France and refers to the larger urban area of Paris including its surroundings). The tournament was only briefly interrupted during the war but once it has resumed it has been running without interruption for more than 35 years. Alekhine won it in 1933 and Rossolimo won eight times between 1934 and 1949. The League Île-de-France des Echecs’s website, which also hosts the tournament’s website, has 5-6000 visits daily, twice more than the French Chess Federation’s website. They cannot afford a salaried person to work on obtaining a sponsorship; Paris hotels are excruciatingly expensive for the Organiser to be able to invite and offer conditions to GMs. 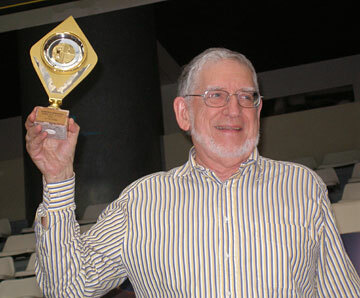 Nevertheless, the 3,000 first prize and the newly included Big Trophy, which if won three times will add another 5,000, attracts a large number of titled players. Rasneur pointed to interesting information: 643 players is quite a significant number to consider the tournament a success, but they used to have in the range of more than 1000 players – before the internet era. When players were not equipped with the technology of today they would flock to the tournament, which was a good possibility to play chess, either for pleasure or for competition, surrounded with likeminded fellow chess players. However, today amateur players tend to be more inclined to remain by their computers than to travel to the capital. 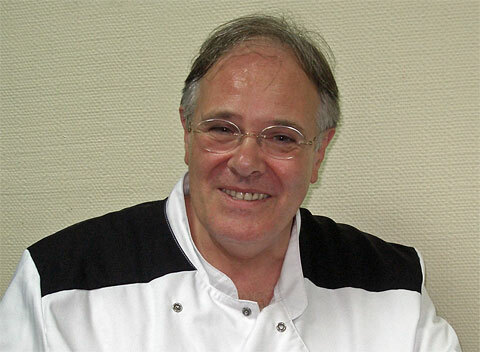 André Rasneur, in the Gallic spirit, was also the main force behind the counter of the makeshift cafeteria that served sandwiches, drinks and delicious gateaux during the tournament. Hence this very fashionable jacket he is sporting, which was especially designed in black and white to symbolise our beloved game. Players met with various reactions the unusual schedule of the start of the games, 7 p.m. The chief arbiter, Nadir Bounzou, joined in our conversation to give a justification, which is twofold: it enables French players, which make a significant majority to come after 6 p.m. when they finish work and it gives chance to foreign players to explore Paris during the day. With the games finished, players would head towards the nearest metro station, Porte St Cloud, which became a ground for some pleasant midnight ‘rencontres’ (meetings). My first chance meeting on the metro platform, just before catching the after midnight train, was Isabelle Bonvalot. For about half an hour, until the first change of line, our conversation revealed that I was sitting next to the person responsible for the smooth running of the computerised giant screen on which the first twelve sensory boards were projected. Apart from her IT expertise Isabelle had a well of information about the tournament itself, because she was directly involved in its organisation when she was a President of the League Île-de-France des Echecs, from 1999 to 2007. 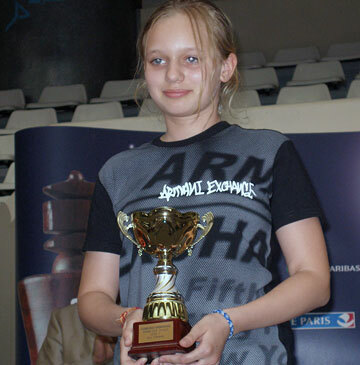 She is also a chess player and although less active lately she still fills in on the last board of one of the most successful French ladies’ team ‘Clichy’, six times national champion, along with Almira Scripchenko (FRA), Antoaneta Stefanova (BUL) and Marlies Bensdorf (NED). How do young players fare with late night chess fights? It is summer school holidays so they can recover with a long morning sleep. Another pleasant meeting before catching the midnight train: Karim Larovi accompanies home his son Idriss (on the left) and his school mates Jacques Peng and Yaniss Ghanem all of whom take part in the Group C. Idriss cheekily let me know that, after the 5th round, he has already made three points. After midnight, the children’s restlessness took the better of them. The metro carriage became another playground where they saw fit to climb the metal poles in which Idriss particularly excelled. Not even the presence of their chess teacher Clement Rabineau would restrain them. 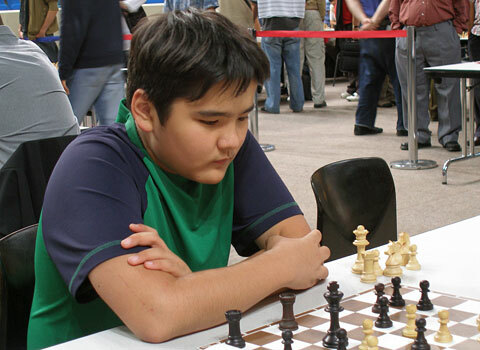 Clement played in the FIDE group. Unfortunately, his IM norm escaped him by just 1/5 of a point. He teaches chess at schools and feels that France is embracing steadily the introduction of ‘chess in schools’ with ever greater number of schools joining the FIDE supported initiative. 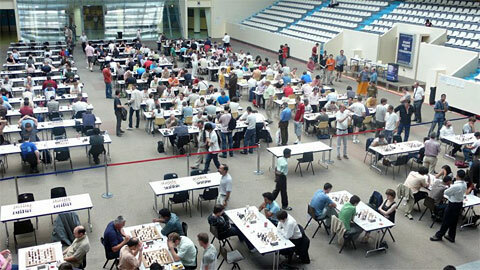 In the playing hall, the section that was creating the greatest buzz was obviously the FIDE Masters. This year almost a quarter of the players came from India as part of the Indian Chess Federation’s program to boost its players’ activity and support their participation at international tournaments. 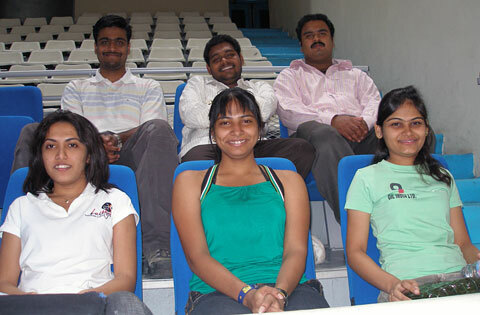 (From left first row) WGM Karavade Eesha, WGM Gomes Mary Ann, WGM Mohota Nisha, (from left second row) IM Kore Akshayrat, GM Chakravarty Deepan and IM K. Rathnakaran are part of a group of thirteen players from India that came to the tournament fully sponsored by the All India Chess Federation. Ravindra Dongre, the Federation’s Secretary general also travelled to Paris with them and he has all reasons to be proud. Most of them were all in the upper end of the results list with GM Parimarjan Negi, winning the Best Young Player Prize; WGM Mary Ann Gomez won the Ladies’ Prize and an IM norm; WGM Karavade Eesha made her fifth IM norm and surpassed the required 2400 Elo to secure the title. 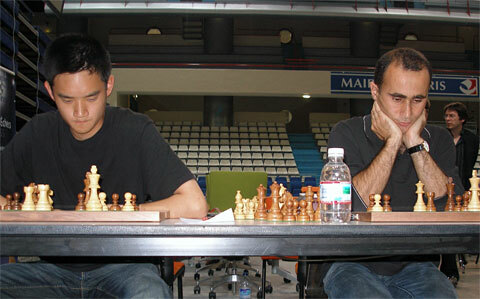 After the second round loss to GM Pavel Govciyan (FRA) Jules was inconsolable. 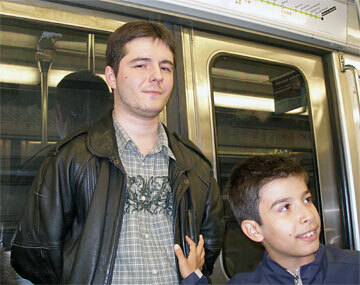 Not even his father could bring a smile on his ambitious son’s face. 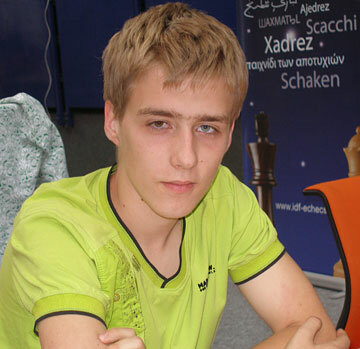 But Jules finished the tournament with 5/9, 2473 performance and his first IM norm. The prize giving ceremony was a long affair, which was nicely rounded off with a cocktail party with drinks and cakes. It was preceded by a long line-up and presentation of cups to the winners in the French teams’ competitions. The organisers provided a nicely crafted cup for each of the tournament’s many prizes in various categories. As I was observing the numerous, shiny trophies (this is only one of two large tables covered with them) three young people were also avidly looking at them. Jacques, Idriss and Yaniss, my cheeky friends from the metro station of a few nights ago had recognised me and I have heard a squeaky voice: "A photo with our dreams?!" Mais, oui! Of course, my lads. # Title Player Rating Nat. Pts Tr. Perf. 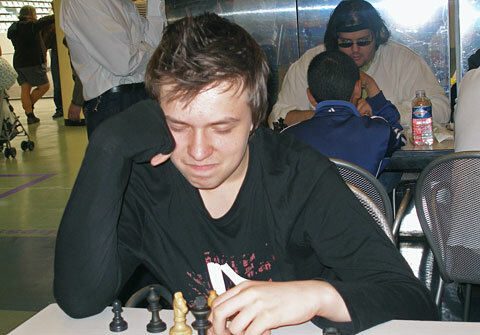 Murtas has lived in France for two years and played at various tournaments as well as the teams championships playing for Cannes Echecs. The last year he spent in Paris. This city has been his dream since his teenage years. An avid reader, Murtas came across a description in a story by Hemingway, which he paraphrases: "Paris is an endless celebration. You have to live in Paris in order to know it. And you have to live there when you are young…". Murtas: "It took me fifteen years to realise my dream. I have learned French and I have discovered my own Paris – not just the touristy one but also its obscure little streets, hidden bars – all the time I discover something new – just as in chess." Having realised his dream Murtas will be returning soon to Kazakhstan, as home is calling. 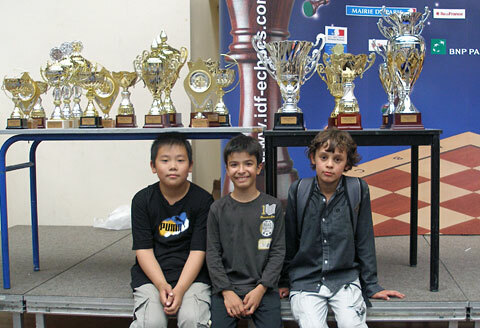 He will have happy memories of a very successful year in Paris: Murtas also won this year’s Blitz (in January) and Rapid (in May) French championships. Is chess his main profession? 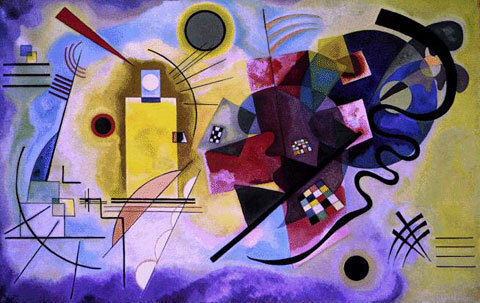 "Three years ago I thought I should abandon chess. 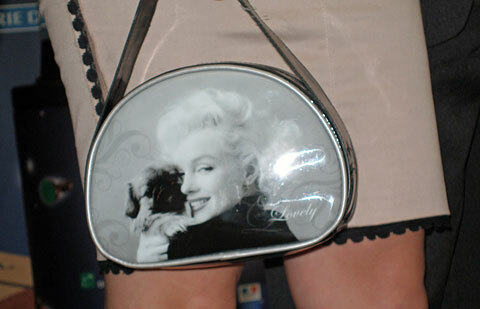 But I couldn’t find anything better. Play, travel and freedom, even though a relative freedom – it is quite an advantage." His name will be engraved on the huge League d’Ile de France Trophy, which, from this year comes with an additional 5,000 prize if won three times. Murtas intends to return to Paris and the Championship and, hopefully, add his name on the Trophy two more times. 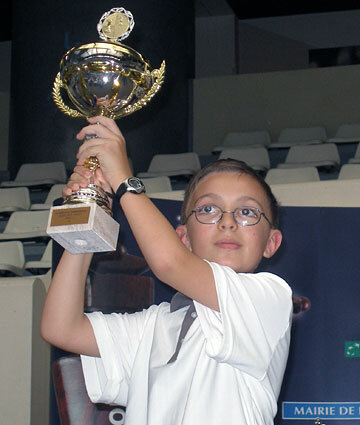 He had already won the Paris Championship once before, in 2006, but the Trophy was not introduced then. 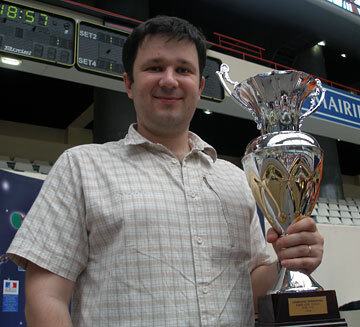 Top seed GM Sergey Fedorchuk (2655, UKR) won the second place and also the title Champion of Paris as he resides in the capital and plays for a Paris team ‘Evry Grand Roque’. 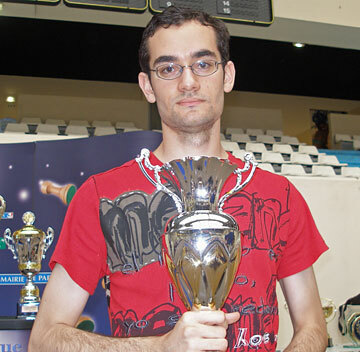 IM Daniel Alsina Leal was happy to have decided to come to play in Paris, where he made 6.5/9 and won the third place. He is from Spain and this time of the year, he normally plays in the Catalan circuit, in Barcelona. But thanks to his brother who lives in Paris who offered him to stay at his place, Daniel decided to make a little chess tour, going from Paris to the Politiken Cup in Denmark and afterwards to the Jubilee Open in Zurich. 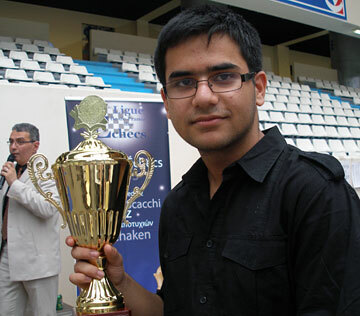 GM Parimarjan Negi (IND) won the prize fro Best Young Player (6.0/9). In the background is Chief Arbiter Nadir Bounzou, announcing the prizes. 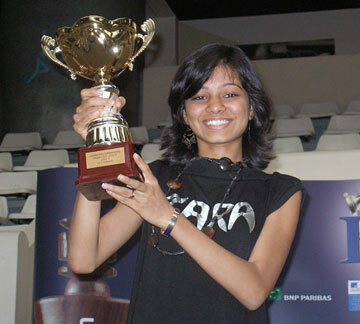 Amruta Sunil Mokal (IND) played in the group A. The WIM title had escaped her so far, even though she had already made four WIM norms at various tournaments. The Paris Open will be it then! She won the Ladies’ Prize and 2268 performance which would bring her the WIM title. Alas, the future belongs to the young. Florian Lutard made 7.5/9 and won the first place in the Group C.
Victoria is Russian but has been living in Paris for the last seven years. Her family who came to cheer her up at the ceremony are hoping that they will be granted soon official residential status in France. Maria already speaks perfect French and trains regularly with WGM Maria Leconte. There were also prizes for best dressed player – "Prix d’Elégance", probably unique to the Paris Championnat. It is not a frivolous idea. I could notice with pleasure that ladies and men generally made effort to come to the playing boards in very presentable outfits. 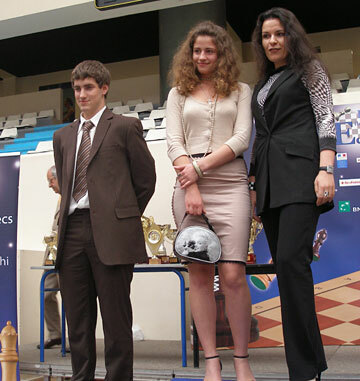 With such a statement on her accessory, this lady was bound to clinch the "prize for elegance" – a yearly subscription to the popular chess magazine "France Echecs". André Rasneur and Isabelle Bonvalot in our conversations brought up the subject of a future French Museum of Chess, which is just in its inception on the initiative of Michel Benoit (picture above). Brought up in the seaside town Deauville, a place of the famous film festival, Benoit has been collecting signatures and photos of film stars since very early years. Later on, as a chess player he switched his passion for collecting on chess memorabilia. He accumulated a little mount of chess games, photos, documents, signatures, writings, letters – some of which paid handsome dividends: a buyer from Zurich paid 3000 euro for a score-sheet of a game Fischer v Mazzoni (Monte Carlo c.1967). However, he would now like to place his remaining collection and future findings in a proper Chess Museum. Famous chess players like Rossolimo, Tartakover and Alekhine made France their home for various lengths of time. The legendary club Caissa that was sponsored by a generous benefactor, Mme Le Bey Tallis, and through which many a famous player have passed including the contemporary ones like Spassky and Joel Lautier who made his debut at the club, is no longer in existence. 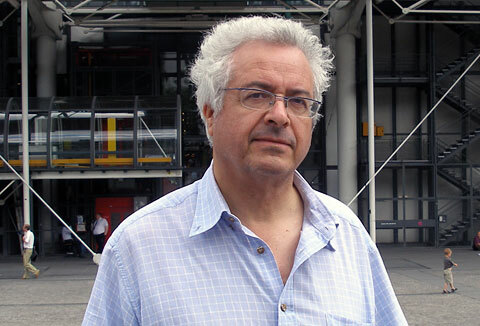 Benoit felt it was pity that worthy chess events, games and personalities disappear without a trace and suggested his idea of creating a Chess Museum to the President of the French Chess Federation, Jean-Claude Moingt. Supported by the Federation, which is moving in new premises in two years time, it is hoped that it will house the new museum as well. The path of Benoit’s chess treasure hunting led him to some remaining family members of Philidor, the 18th century French player and composer, and he is hoping that the arranged meeting with them would produce some unseen documents. He also came across some obscure Philidor Friends Society who is promoting not Philidor the chess player but Philidor the musician. Michel Benoit met me in front of the Centre Beaubourg (a.k.a. Centre Georges Pompidou), the Museum for Contemporary Arts, before my viewing the retrospective exhibition of works by Kandinsky, the Russian forerunner of abstract art. A glimpse of the façade of the Museum’s modern architecture – a mechanical skeleton of brightly coloured tubes – can be seen on the photograph. It was designed in 1977 by architects Renzo Piano (Italy) and Richard Rogers (Great Britain).